This Dresden foil number "0" is green foil on both sides and features a gnome on a swing with a snail and flowers below. The number itself is 3.5" tall and has an attached wire that measures 5" -- please note the wire is longer than shown in the picture. The wire is food-safe for use decorating cakes and cupcakes and can be removed easily. Made in Germany. This Dresden foil number "0" is red foil on both sides and features a gnome on a swing with a snail and flowers below. The number itself is 3.5" tall and has an attached wire that measures 5" -- please note the wire is longer than shown in the picture. The wire is food-safe for use decorating cakes and cupcakes and can be removed easily. Made in Germany. 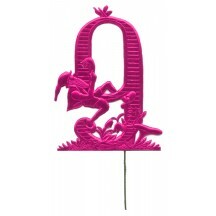 This Dresden foil number "2" is fuchsia foil on both sides and features a gnome climbing a vine that curves up the number . The number itself is 3.5" tall and has an attached wire that measures 5" -- please note the wire is longer than shown in the picture. The wire is food-safe for use decorating cakes and cupcakes and can be removed easily. Made in Germany. 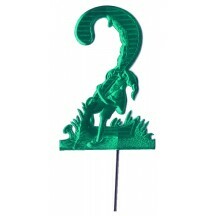 This Dresden foil number "2" is green foil on both sides and features a gnome climbing a vine that curves up the number . The number itself is 3.5" tall and has an attached wire that measures 5" -- please note the wire is longer than shown in the picture. The wire is food-safe for use decorating cakes and cupcakes and can be removed easily. Made in Germany. This Dresden foil number "2" is red foil on both sides and features a gnome climbing a vine that curves up the number . The number itself is 3.5" tall and has an attached wire that measures 5" -- please note the wire is longer than shown in the picture. The wire is food-safe for use decorating cakes and cupcakes and can be removed easily. Made in Germany. 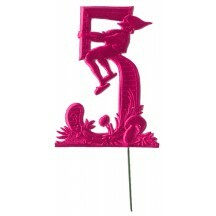 This Dresden foil number "3" is fuchsia foil on both sides and features a gnome playing a bass fiddle for a bird perched on the number. 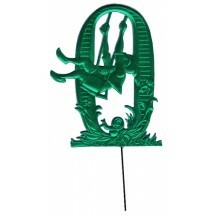 The number itself is 3.5" tall and has an attached wire that measures 5" -- please note the wire is longer than shown in the picture. The wire is food-safe for use decorating cakes and cupcakes and can be removed easily. Made in Germany. 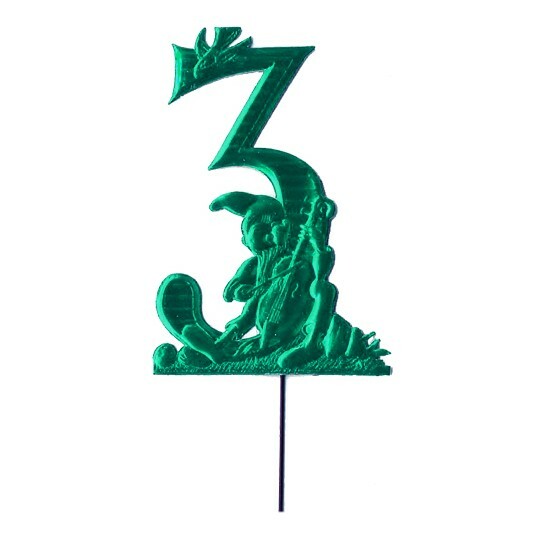 This Dresden foil number "3" is green foil on both sides and features a gnome playing a bass fiddle for a bird perched on the number. The number itself is 3.5" tall and has an attached wire that measures 5" -- please note the wire is longer than shown in the picture. The wire is food-safe for use decorating cakes and cupcakes and can be removed easily. Made in Germany. 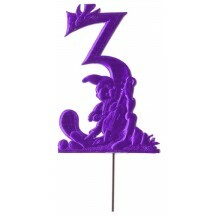 This Dresden foil number "3" is purple foil on both sides and features a gnome playing a bass fiddle for a bird perched on the number. The number itself is 3.5" tall and has an attached wire that measures 5" -- please note the wire is longer than shown in the picture. The wire is food-safe for use decorating cakes and cupcakes and can be removed easily. Made in Germany. 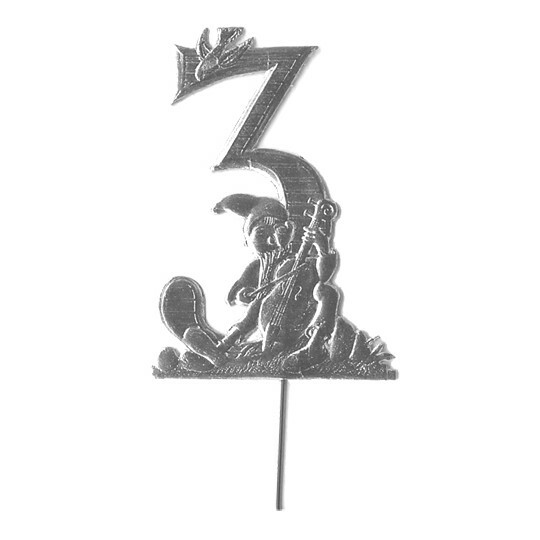 This Dresden foil number "3" is red foil on both sides and features a gnome playing a bass fiddle for a bird perched on the number. The number itself is 3.5" tall and has an attached wire that measures 5" -- please note the wire is longer than shown in the picture. The wire is food-safe for use decorating cakes and cupcakes and can be removed easily. Made in Germany. This Dresden foil number "3" is silver foil on both sides and features a gnome playing a bass fiddle for a bird perched on the number. The number itself is 3.5" tall and has an attached wire that measures 5" -- please note the wire is longer than shown in the picture. The wire is food-safe for use decorating cakes and cupcakes and can be removed easily. Made in Germany. 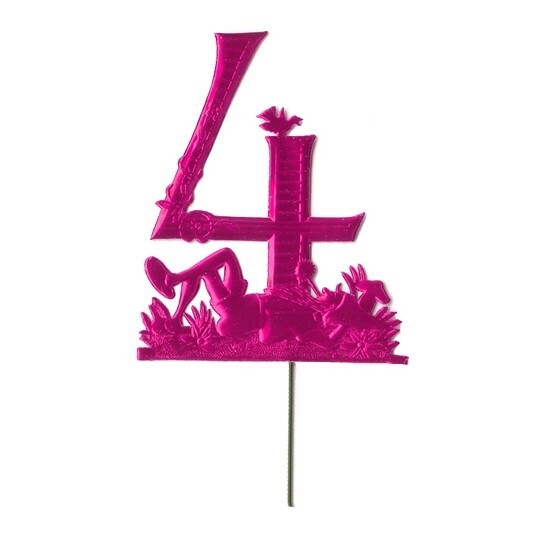 This Dresden foil number "4" is fuchsia foil on both sides and features a gnome relaxing by a mushroom while a bird perches on the number. The number itself is 3.5" tall and has an attached wire that measures 5" -- please note the wire is longer than shown in the picture. The wire is food-safe for use decorating cakes and cupcakes and can be removed easily. Made in Germany. This Dresden foil number "4" is gold foil on both sides and features a gnome relaxing by a mushroom while a bird perches on the number. The number itself is 3.5" tall and has an attached wire that measures 5" -- please note the wire is longer than shown in the picture. The wire is food-safe for use decorating cakes and cupcakes and can be removed easily. Made in Germany. This Dresden foil number "4" is green foil on both sides and features a gnome relaxing by a mushroom while a bird perches on the number. The number itself is 3.5" tall and has an attached wire that measures 5" -- please note the wire is longer than shown in the picture. The wire is food-safe for use decorating cakes and cupcakes and can be removed easily. Made in Germany. 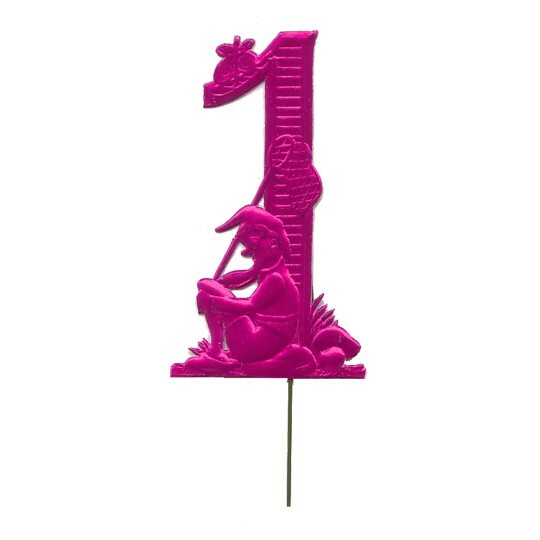 This Dresden foil number "4" is purple foil on both sides and features a gnome relaxing by a mushroom while a bird perches on the number. The number itself is 3.5" tall and has an attached wire that measures 5" -- please note the wire is longer than shown in the picture. The wire is food-safe for use decorating cakes and cupcakes and can be removed easily. Made in Germany. This Dresden foil number "4" is red foil on both sides and features a gnome relaxing by a mushroom while a bird perches on the number. The number itself is 3.5" tall and has an attached wire that measures 5" -- please note the wire is longer than shown in the picture. The wire is food-safe for use decorating cakes and cupcakes and can be removed easily. Made in Germany. This Dresden foil number "4" is silver foil on both sides and features a gnome relaxing by a mushroom while a bird perches on the number. The number itself is 3.5" tall and has an attached wire that measures 5" -- please note the wire is longer than shown in the picture. The wire is food-safe for use decorating cakes and cupcakes and can be removed easily. Made in Germany. 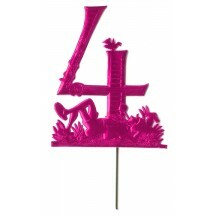 This Dresden foil number "5" is fuchsia foil on both sides and features a gnome sitting on the five above mushrooms and flowers. The number itself is 3.5" tall and has an attached wire that measures 5" -- please note the wire is longer than shown in the picture. The wire is food-safe for use decorating cakes and cupcakes and can be removed easily. Made in Germany. This Dresden foil number "5" is gold foil on both sides and features a gnome sitting on the five above mushrooms and flowers. The number itself is 3.5" tall and has an attached wire that measures 5" -- please note the wire is longer than shown in the picture. The wire is food-safe for use decorating cakes and cupcakes and can be removed easily. Made in Germany. This Dresden foil number "5" is green foil on both sides and features a gnome sitting on the five above mushrooms and flowers. The number itself is 3.5" tall and has an attached wire that measures 5" -- please note the wire is longer than shown in the picture. The wire is food-safe for use decorating cakes and cupcakes and can be removed easily. Made in Germany. This Dresden foil number "5" is red foil on both sides and features a gnome sitting on the five above mushrooms and flowers. The number itself is 3.5" tall and has an attached wire that measures 5" -- please note the wire is longer than shown in the picture. The wire is food-safe for use decorating cakes and cupcakes and can be removed easily. Made in Germany. This Dresden foil number "5" is silver foil on both sides and features a gnome sitting on the five above mushrooms and flowers. The number itself is 3.5" tall and has an attached wire that measures 5" -- please note the wire is longer than shown in the picture. The wire is food-safe for use decorating cakes and cupcakes and can be removed easily. Made in Germany. This Dresden foil number "6" is fuchsia foil on both sides and features a gnome plucking a mushrooms with a long fork. The number itself is 3.5" tall and has an attached wire that measures 5" -- please note the wire is longer than shown in the picture. The wire is food-safe for use decorating cakes and cupcakes and can be removed easily. Made in Germany. 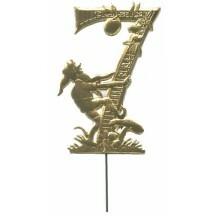 This Dresden foil number "6" is gold foil on both sides and features a gnome plucking a mushrooms with a long fork. 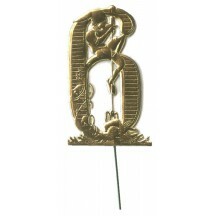 The number itself is 3.5" tall and has an attached wire that measures 5" -- please note the wire is longer than shown in the picture. The wire is food-safe for use decorating cakes and cupcakes and can be removed easily. Made in Germany. This Dresden foil number "6" is purple foil on both sides and features a gnome plucking a mushrooms with a long fork. The number itself is 3.5" tall and has an attached wire that measures 5" -- please note the wire is longer than shown in the picture. The wire is food-safe for use decorating cakes and cupcakes and can be removed easily. Made in Germany. This Dresden foil number "6" is red foil on both sides and features a gnome plucking a mushrooms with a long fork. The number itself is 3.5" tall and has an attached wire that measures 5" -- please note the wire is longer than shown in the picture. The wire is food-safe for use decorating cakes and cupcakes and can be removed easily. Made in Germany. This Dresden foil number "6" is silver foil on both sides and features a gnome plucking a mushrooms with a long fork. The number itself is 3.5" tall and has an attached wire that measures 5" -- please note the wire is longer than shown in the picture. The wire is food-safe for use decorating cakes and cupcakes and can be removed easily. Made in Germany. 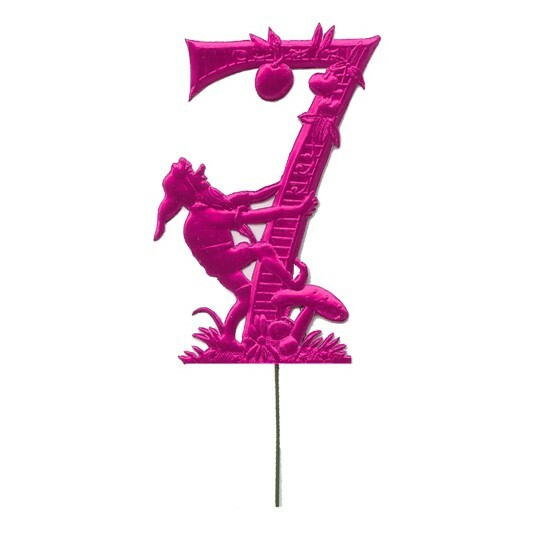 This Dresden foil number "7" is fuchsia foil on both sides and features a gnome climbing up the number to pick an apple with mushrooms below. The number itself is 3.5" tall and has an attached wire that measures 5" -- please note the wire is longer than shown in the picture. The wire is food-safe for use decorating cakes and cupcakes and can be removed easily. Made in Germany. This Dresden foil number "7" is gold foil on both sides and features a gnome climbing up the number to pick an apple with mushrooms below. The number itself is 3.5" tall and has an attached wire that measures 5" -- please note the wire is longer than shown in the picture. The wire is food-safe for use decorating cakes and cupcakes and can be removed easily. Made in Germany. This Dresden foil number "7" is green foil on both sides and features a gnome climbing up the number to pick an apple with mushrooms below. The number itself is 3.5" tall and has an attached wire that measures 5" -- please note the wire is longer than shown in the picture. The wire is food-safe for use decorating cakes and cupcakes and can be removed easily. Made in Germany. 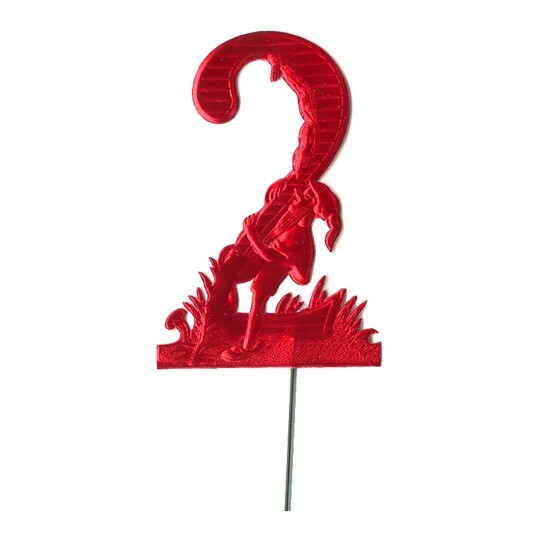 This Dresden foil number "7" is red foil on both sides and features a gnome climbing up the number to pick an apple with mushrooms below. The number itself is 3.5" tall and has an attached wire that measures 5" -- please note the wire is longer than shown in the picture. The wire is food-safe for use decorating cakes and cupcakes and can be removed easily. Made in Germany. This Dresden foil number "7" is silver foil on both sides and features a gnome climbing up the number to pick an apple with mushrooms below. The number itself is 3.5" tall and has an attached wire that measures 5" -- please note the wire is longer than shown in the picture. The wire is food-safe for use decorating cakes and cupcakes and can be removed easily. Made in Germany. 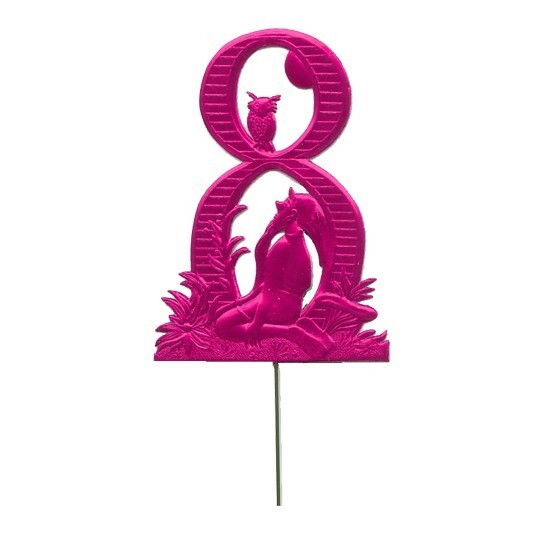 This Dresden foil number "8" is fuchsia foil on both sides and features a gnome sitting amongst plants lookng up at an owl and part of the moon. The number itself is 3.5" tall and has an attached wire that measures 5" -- please note the wire is longer than shown in the picture. The wire is food-safe for use decorating cakes and cupcakes and can be removed easily. Made in Germany. 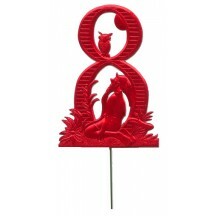 This Dresden foil number "8" is red foil on both sides and features a gnome sitting amongst plants lookng up at an owl and part of the moon. The number itself is 3.5" tall and has an attached wire that measures 5" -- please note the wire is longer than shown in the picture. The wire is food-safe for use decorating cakes and cupcakes and can be removed easily. Made in Germany. 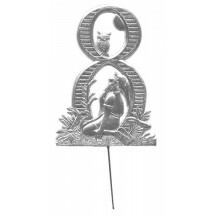 This Dresden foil number "8" is silver foil on both sides and features a gnome sitting amongst plants lookng up at an owl and part of the moon. The number itself is 3.5" tall and has an attached wire that measures 5" -- please note the wire is longer than shown in the picture. The wire is food-safe for use decorating cakes and cupcakes and can be removed easily. Made in Germany. This Dresden foil number "9" is fuchsia foil on both sides and features a gnome cimbing up the number with mushrooms and plants below. The number itself is 3.5" tall and has an attached wire that measures 5" -- please note the wire is longer than shown in the picture. The wire is food-safe for use decorating cakes and cupcakes and can be removed easily. Made in Germany. This Dresden foil number "9" is green foil on both sides and features a gnome cimbing up the number with mushrooms and plants below. The number itself is 3.5" tall and has an attached wire that measures 5" -- please note the wire is longer than shown in the picture. The wire is food-safe for use decorating cakes and cupcakes and can be removed easily. Made in Germany. This Dresden foil number "9" is purple foil on both sides and features a gnome cimbing up the number with mushrooms and plants below. The number itself is 3.5" tall and has an attached wire that measures 5" -- please note the wire is longer than shown in the picture. The wire is food-safe for use decorating cakes and cupcakes and can be removed easily. Made in Germany. This Dresden foil number "9" is red foil on both sides and features a gnome cimbing up the number with mushrooms and plants below. The number itself is 3.5" tall and has an attached wire that measures 5" -- please note the wire is longer than shown in the picture. The wire is food-safe for use decorating cakes and cupcakes and can be removed easily. Made in Germany. This Dresden foil number "9" is silver foil on both sides and features a gnome cimbing up the number with mushrooms and plants below. The number itself is 3.5" tall and has an attached wire that measures 5" -- please note the wire is longer than shown in the picture. The wire is food-safe for use decorating cakes and cupcakes and can be removed easily. Made in Germany.